90 x 350mg Veg. Caps. Garlic is known as the 'Wonder Drug' of herbs and can help with everything from ear infection to preventing heart disease. It has earned the name 'Russian Penicillin' as it was used heavily as a disinfectant during wartime before the availability of modern antibiotics. It is a wonderful digestive aid, has been shown to destroy certain types of cancer cells, and reduces blood pressure and blood lipids which can cause heart disease. Take 2 capsules a day. Should be stopped at therapeutic doses 10 days before surgery due to blood thinning action. Observe caution if taking anti-coagulant medication.Can cause flatulence and colic in breastfed infants if taken by mother. Use cautiously in conjunction with protease inhibitor drugs. Can be heating, so drink more water when taking this remedy. 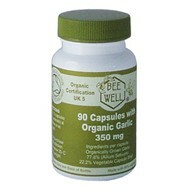 Discontinue use if gastric disturbance or dermatitis is experienced.